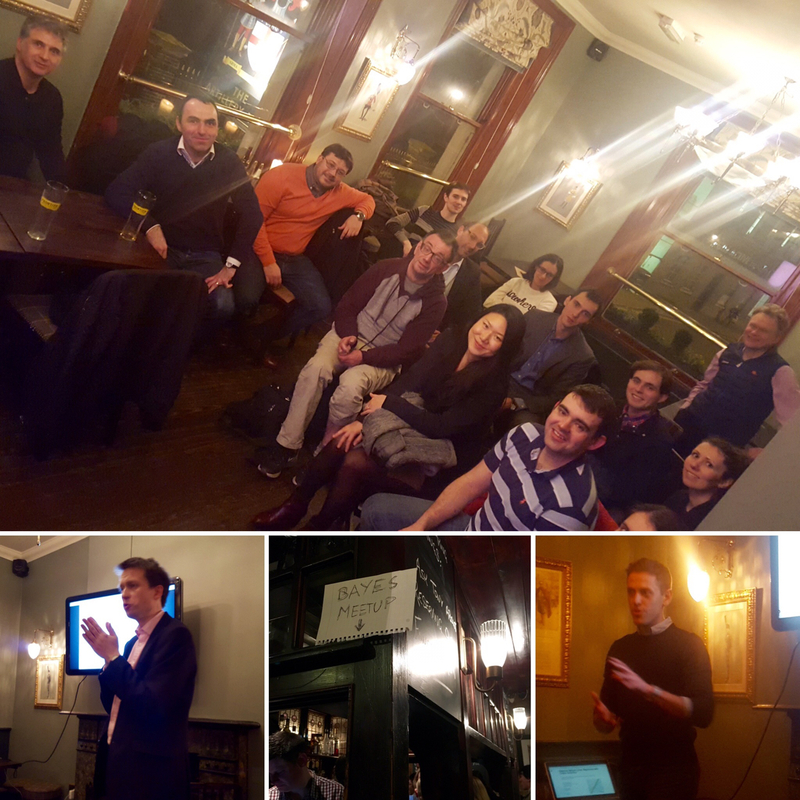 We had our first successful Bayesian Mixer Meetup last Friday night at the Artillery Arms! We expected about 15 - 20 people to turn up, when we booked the function room overlooking Bunhill Cemetery and Bayes’ grave. Now, looking at the photos taken during the evening, it seems that our prior believe was pretty good. The event started with a talk from my side about some very basic Bayesian models, which I used a while back to get my head around the concepts in an insurance context. My talk “Experience vs Data” was based on presentations I had given last year at LondonR and the Warsaw R user group. Jon Sedar followed with a fascinating talk about outlier detection using PyMC3. Suppose, you have a bunch of data points, most of them centred, but with some further away. How do you decide if they are outliers, or not? This question sounds very relevant to me in the insurance context as well. I have heard stories of underwriters telling me that certain years or events (meaning costly losses) were freaks, and should be disregarded, or in other words, without those losses the underwriter would have made a huge profit. I am not sure, I buy those arguments, as they undermine the fundamental business proposition of insurance; to pay, when policyholders experience ‘freak’ events. I am getting on my soap box, which I shouldn’t. We had a good night, very good discussions and some drinks. As a result Jon and I are committed to organise another event. Jon has already set up a Meetup page, so please register online and get in touch with ideas, venues, talks, etc.